At Davis Dodge, we couldn't be more proud of our lineup of new 2015 Jeep Cherokees! 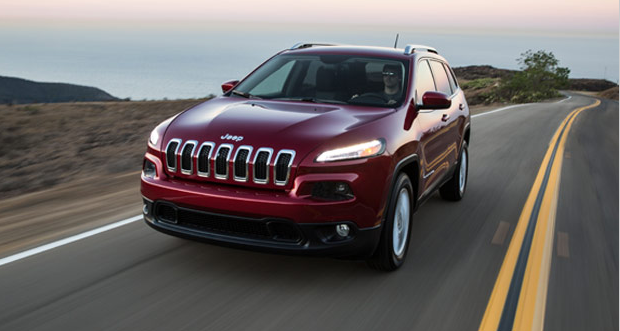 The Jeep Cherokee comes in several of options, like the Jeep Cherokee Sport, Jeep Cherokee North, Jeep Cherokee Limited and our major award winner, the Jeep Cherokee Trailhawk. The Jeep's history has resulted in engineers seeking perfection for the ultimate off-road ride. Talk with one of our representatives today, and learn why vehicle buyers come from Calgary, Lethbridge and Pincher Creek for a shopping experience at Davis Dodge. Four Wheeler magazine's 2015 "Four Wheeler of the Year"
With Jeep Active Drive Lock 4x4 system, 56:1 crawl ratio, 220 mm (8.7 in) of ground clearance and Selec-Terrain® Traction Management System, the Trailhawk simply goes further. 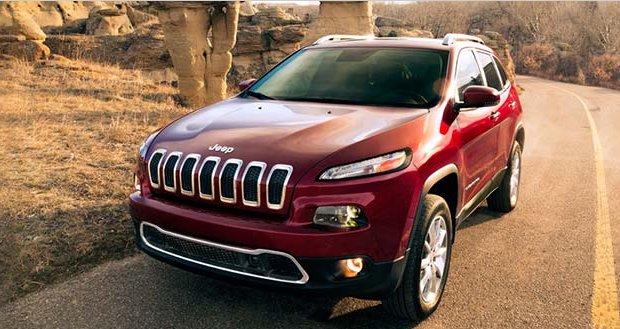 The Cherokee employs modern and functional design that represents the freedom of the Jeep brand. The exterior is both eye-catching and aerodynamically efficient to reduce noise and improve fuel economy. The standard LED daytime running lights and taillamps highlight the exterior and provide excellent visibility, safety and style. 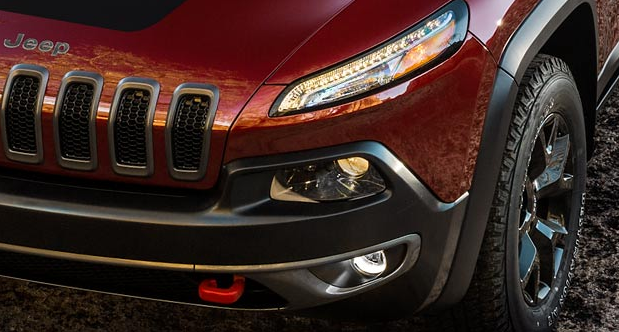 Automatic headlamps come standard on North, Limited and Trailhawk® for seamless operation. 9-speed automatic transmission32 for strong performance and fuel economy. On 4x4 models, an Industry-First rear axle disconnect32 further enhances overall efficiency. There can only be one best. 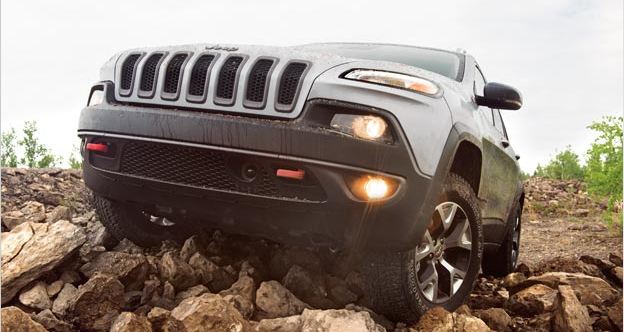 That's why the Jeep® Cherokee Trailhawk® was named FOUR WHEELER's 2015 Four Wheeler of the Year. With its combination of world-class on-road driving dynamics, exceptional fuel economy and Best-in-Class capability33, confidence follows no matter where go. The Class-Exclusive 9-speed automatic transmission shifts seamlessly for a ride that is powerful, responsive and smooth whether tackling the rough off-road trails or cruising the boulevard. The front and rear suspensions are built with high-strength, lightweight steel and aluminum. This delivers a refined on-pavement ride free of unwanted noise, vibration and harshness, but also creates a solid foundation for legendary off-road capability. The Cherokee takes you further off the beaten path with 3 available and rugged 4x4 systems. Jeep Active Drive I – Ideal for those wanting all-weather capability. Includes a rear axle disconnect that only engages 4x4 when needed to improve fuel economy. Jeep Active Drive II – This system adds a low range for more extreme activities like rock crawling, as well as a neutral mode for flat towing behind an RV. Jeep Active Drive Lock – Standard on Trailhawk®, this system has a locking rear differential for low-speed power in extreme conditions. Standard on Sport and North models is the Uconnect® 5.0 multimedia centre with hands-free communication16, Bluetooth® streaming audio and voice command, as well as USB port and audio input jack. 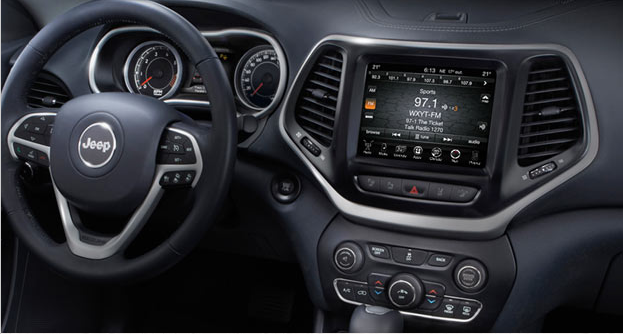 Limited and Trailhawk upgrade to Uconnect 8.4 with a largest-in-class 8.4-inch touchscreen. Navigation14 is available to keep you on track. 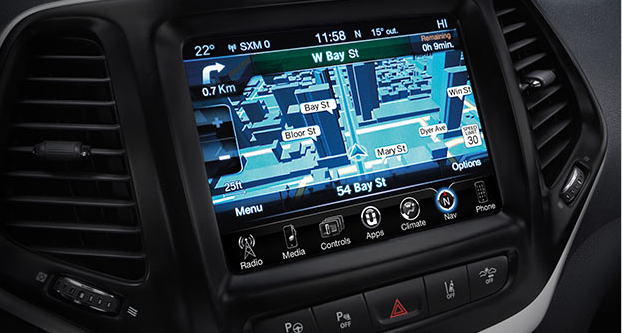 The available Uconnect® 8.4 NAV multimedia centre equips you with 3D navigation. It displays your route with recognizable landmarks for efficient and clear directions, and can be controlled using voice commands. This feature provides a full-colour display that keeps you informed about vehicle data like fuel economy and temperatures, as well as available systems like the Selec-Terrain® mode, Park Assist details and more. 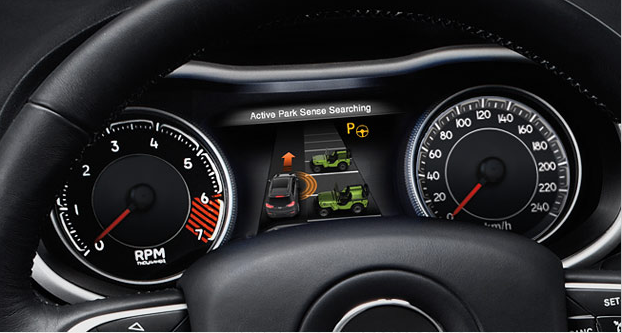 This available system can detect when you're approaching a vehicle or obstacle at an unsafe speed thanks to sensors mounted in the front. If this happens, it pre-fills the brakes to prepare for emergency driver intervention, along with providing an audible and visual warning. If the driver does not respond, the system briefly engages the brakes to alert the driver. If there is still no response, a 1.5 second brake deployment is used to attempt to alert the driver again. Advanced Brake Assist will also kick in if the driver is not braking aggressively enough. If the vehicle starts unintentionally drifting out of its lane without using the indicators, this available feature8 will warn you visually and through a haptic warning – a "shiver" in the steering wheel. A forward-mounted camera detects and measures the vehicle's position within a lane. If the driver does not respond to the warnings, Lane Keep Assist will help gently nudge the vehicle back into the lane by applying corrective steering input. 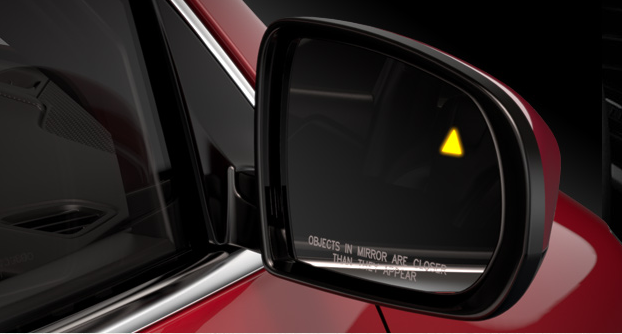 Blind-Spot Monitoring helps alert you when a vehicle enters your blind-spot area via an audible alert inside the vehicle and a visual icon on the sideview mirror for safer lane changes. Rear Cross-Path Detection is included and uses rear-facing sensors to alert you of vehicles and objects approaching from either side as you reverse out of a spot. 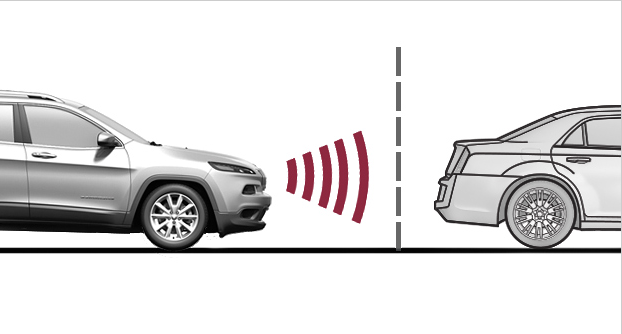 These 2 features, along with Park-Sense Rear Park Assist, are part of the SafetyTecTM Group available on North, Limited and Trailhawk®. Take a look at the Jeep Cherokee today!